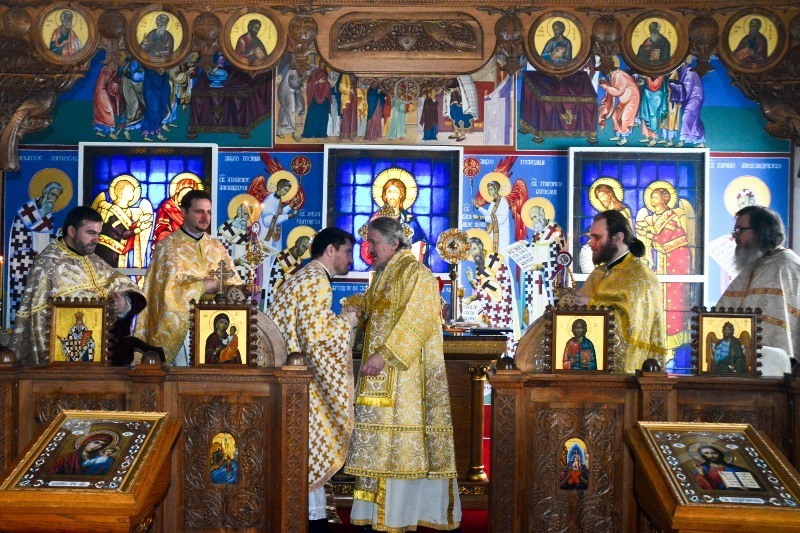 Mars, PA - On the Feast of the Presentation of the Lord, February 15, 2014, His Grace Bishop Dr. MITROPHAN officiated at the Hierarchical Divine Liturgy at St. Nikodim Chapel at the Episcopal Headquarters, Mars, Pennsylvania. 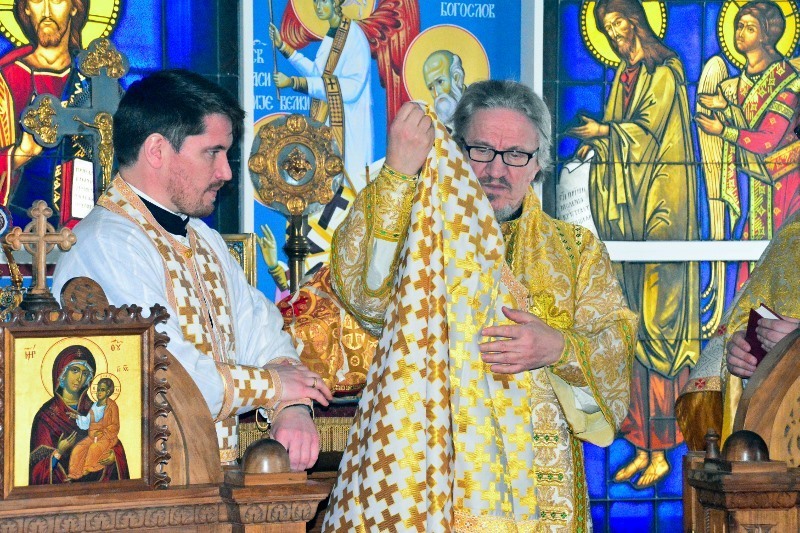 The festal celebration increased in joy with the ordination of Diocesan Secretary Father Deacon Branislav Golic to the rank of Presbyter. 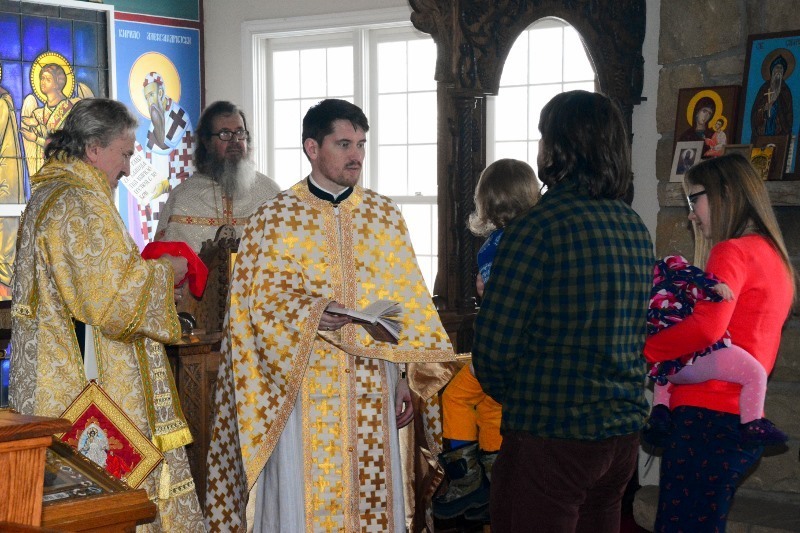 Additional clergy serving during the Divine Liturgy included Very Rev. 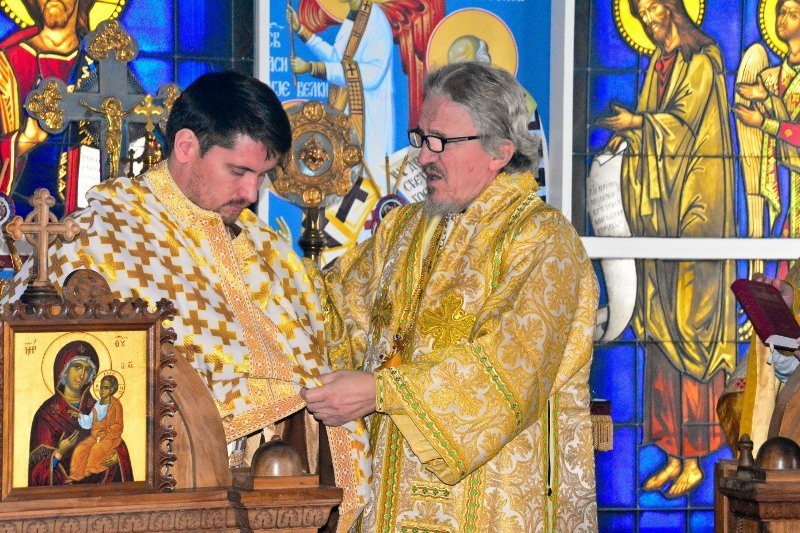 Stavrophor Dr. Rodney Torbic, Very Rev. 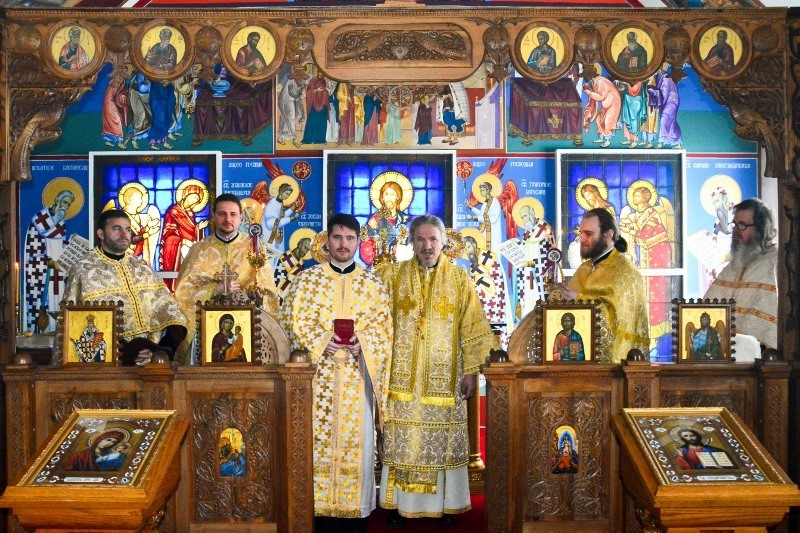 Rajko Kosic, Hieromonk Platon (Jovic) and Rev. Father Dragan Goronjic. Episcopal Secretary Milovan Jovanovic sang the responses. Family members and friends were in attendance for this joyous occasion. Following the Divine Liturgy, the attendees gathered for a festal and celebratory meal in the Diocesan dining areas. A number of young children were present. Fr. Branislav was born November 18, 1985, the son of a priest, Fr. Vlatko and Jadranka Golic. In 2000 he enrolled in the Seminary in Sremski Karlovci which he completed with honors in 2004. 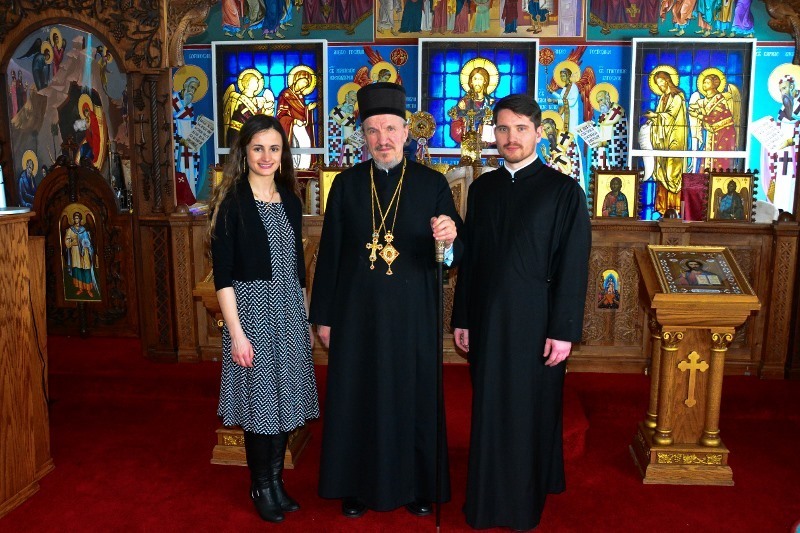 Afterward, he continued his studies at the St. Sava School of Theology in Libertyville from which he graduated in 2009. That same year he began his studies at St. Vladimir's Seminary in New York and in 2011 earned his master's degree. Since March of 2012 he has served as diocesan secretary for the Diocese of Eastern America. In July of 2013 he entered into holy matrimony with Dragana (Masic) Golic. On July 27, 2013 he was ordained to the deaconate by Bishop Mitrophan and since then has served as diocesan deacon. We pray for the new laborer in the Lord's Vineyard that God might bestow upon him the spiritual strength to allow him to find answers to all the challenges and temptations which might meet him in his pastoral ministry.